The new star of the culinary galaxy is South Florida, declares The New York Times. And no wonder. Out of America’s tropical melting pot comes an inventive cuisine bursting with flavor–and now Steven Raichlen, an award-winning food writer, shares the best of it in Miami Spice. 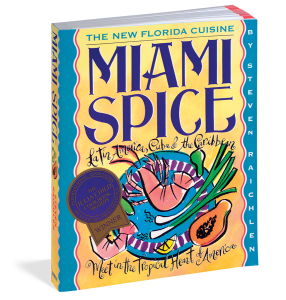 With 200 recipes and firsthand reports from around the state, Miami Spice captures the irresistible convergence of Latin, Caribbean, and Cuban influences with Florida’s cornucopia of stone crabs, snapper, plantains, star fruit, and other exotic native ingredients (most of which can be found today in supermarkets around the country). Main selection of the Book-of-the-Month Club’s HomeStyle Books. Winner of a 1993 IACP/Julia Child Cookbook Award.